As far as salivating in anticipation with starry eyes and very anxious comportment goes, any new Arcade Fire release will always cause an excited and frenzied kerfuffle in the vegan cafés and indie bookstores around the world. After three and nine-twelfths years, Reflektor has a successor at last – a successor that stands in stark opposition with its stylistic differences. Thankfully (in my opinion and absolutely no one else’s, it seems), Arcade Fire have continued to move away from the indie mope and strum that they started out with on 2004’s critically beloved Funeral and continued to obambulate into the spherical confines of the pseudo electro, much like what you would hear with LCD Soundsystem with that dance punk crossover melange. This should be seen as an inevitable blossoming as James Murphy, the nucleus of that aforementioned group, helped produce the album prior to this and has no doubt araldited his influence onto this one too, albeit in a more surreptitious way. 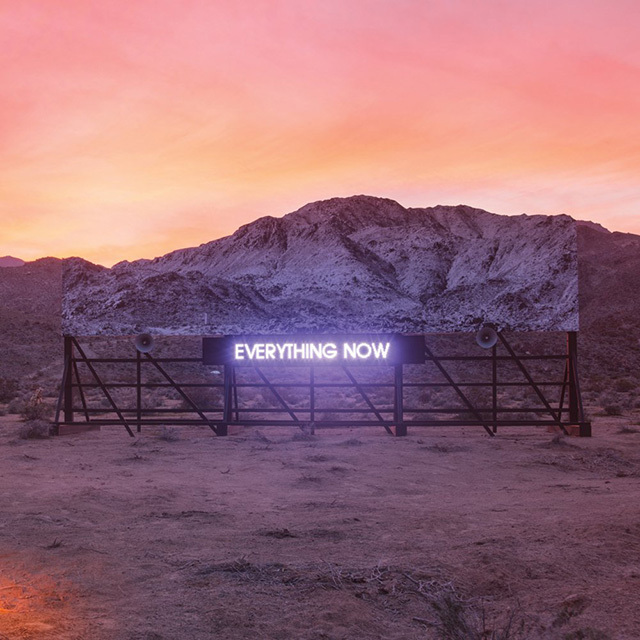 Everything Now is a title that has come from the perceived shift in the Matrix as observed by bandleader Win Butler towards a society that has continued to speed up in the way media is delivered these days (think Crunchyroll and Piratebay). Society has been on this path for some time, so I guess you could imagine the pace of life ramping up from Cheetah to African Swallow in the cosmic game of Sim City being played through the gaze of an already frantic saccade. This whole concept is subtly alluded to throughout and alluded to with the subtlety of a tidal wave in a bathtub during ‘Infinite_Content’ and its very close relative on the album ‘Infinite Content’ and the former is totally a cover of the latter. That was not a typo. The title track also receives the same treatment, although thankfully without the misleading typos that were once so commonplace on Napster and Limewire. Punk goes pop? Old hat. Arcade Fire goes Arcade Fire? Innovation! I’ve always held the songs where Butler’s wife and fellow band member Régine Chassagne purloins the limelight up high, like a caryatid propping up an Ancient Greek temple in the Acropolis. That theme continues on this album. ‘Electric Blue’ is a high-pitched standout track. Along with other songs where she proudly stands front and centre like ‘Sprawl II (Mountains Beyond Mountains)’ from The Suburbs, it makes me wonder, internally and out loud, why we’re yet to see a solo project from her. I have no doubt that it would be received with an intense level of mafficking and elation. The potential is huge. ‘Electric Blue’, along with the title track and also ‘Signs of Life,’ stick out in my mind as the shining stars. Perhaps also ‘Creature Comfort’ makes it onto the team too. This fresh batch of otic fruit that Arcade Fire has brought in from years of being tended to in the creative orchard does seem to be slightly modified in terms of the usual genetics. But the plump shape of sound remains in the same recognisably bulbous form. Being a little bit less ambitious than its predecessor, Everything Now acts as though it’s shuddering and stalling its way through its duration. As if it’s a train that keeps stopping and starting without really picking up any speed. Maybe it’ll grow on me, many albums do after varying periods of time. iTunes tells me I’ve listened to this in full seven times in the past few days. Maybe I’ll be more effusive with my praise once I get to fifteen listens.